Today September 17, is the 75th anniversary of the Soviet Union’s invasion of Poland. This was the implementation of part one of the secret clauses of the Nazi-Soviet pact of August 1939. And today too more than a 1000 Russian troops are conducting an unannounced invasion of Eastern Ukraine to shore up the pro-Russian separatist forces there. The latter had been in full retreat following the downing of the Malaysian airline flight MH-17 and only direct Russian military intervention has stopped it. This latest invasion was the reason for Ukrainian President Poroshenko seeking a ceasefire with Putin on September 3 (ironically the anniversary of the day that Britain declared war on Nazi Germany 75 years ago). How history can appear to repeat itself! But this is neither tragedy nor farce. It is more like James Joyce’s Stephen Daedalus opinion that “history is a nightmare from which I am trying to awake”. Our soldiers were getting wiped out and they never even saw the enemy. It was like a meat grinder. In addition over 2500, mainly non-combatants, lie dead as a result of the attacks of both sides. Millions more, both Russian and Ukrainian speakers, have fled a war in their region that none of them wanted. They are the “collateral damage” of just one more conflict in crisis-ridden capitalist world of increasingly numerous and unending imperialist wars. And it is a secret war just like the war Stalin and Hitler prepared against Poland seventy five years ago. To say that the announcement of the “non-aggression pact” between Nazi Germany and the USSR on August 23 came as a shock to the supporters of Stalinism would be one of the biggest understatements about history. In a single act the USSR had overturned its own policy of “anti-fascism” adopted at the 7th Comintern Congress in 1935. But it had been based on the needs of Russian imperialism. “Anti-fascism” was the slogan to try to win an alliance between the Western democracies and the USSR. It was the slogan which was accepted even by anarchists in the Spanish War – a fact that turned out to be fatal for the Spanish Revolution. By accepting the state of the Spanish Republic in the name of “anti-fascism” they undermined the attempts at social change by the proletarian masses of Spain. The anarchist leaders eventually delivered the workers over to Stalinism which wreaked a heavy price on the working class (who were then decimated for a second time by the victorious Franco regime). Not only did “anti-fascism” not defeat Franco it also provided ideological justification for the second Imperialist war which started only 6 months after the collapse of the Spanish Republic. But our message to today’s “anti-fascists” is that nothing underlines the cynicism of imperialist policy more than the Nazi-Soviet pact of 1939. The whole purpose of “anti-fascism” for Stalin was to win an alliance with the Western democracies to counter the Nazi menace. Communist Parties throughout the world were urged to drop their criticism of Social Democracy as “social fascist” and instead join with them, and any other democratic party, however conservative, in a “Popular Front”. Such governments were actually formed in France and Spain in 1936 but Stalin’s purpose was not achieved. The ruling classes of Britain and France refused to join in a pact to counter the Nazi menace. 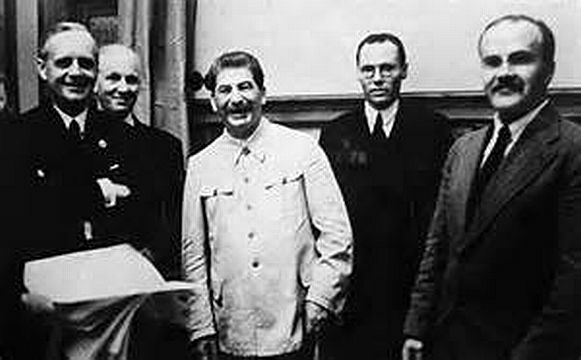 They did not want to unite with a “communist” state and indeed hoped that they could persuade Hitler to attack Russia first. At Munich in September 1938 Stalin offered to send troops to assist the Czechs but the latter (with British and French support) refused them. Hitler invaded the whole of Czechoslovakia only six months later thus tearing up the Munich Agreement. This act, which showed that Hitler would stop at nothing to achieve his war of revenge, still did not entirely shift the British and French governments. They began to enter into desultory negotiations with Stalin. But instead of sending a full delegation with diplomatic power to negotiate they sent one military officer each. The British sent a minor but well-monikered aristocrat, Admiral Reginald Ranfurly Plunckett-Ernle-Erle-Drax by boat to Moscow. He and his French military counterpart had no power to agree to anything and had to go and consult their governments every time a proposal was made. The Russians, who knew that any alliance had to be political as well as military, got the message. They had already been negotiating with the German Foreign Ministry and this was now the main option. Stalin had been so keen to pursue these negotiations with the Nazis that in May 1939 he replaced the Jewish Litvinov with his henchman Molotov as Foreign Minster (instructed to purge his ministry of all Jews). Putting aside years of common denunciations, somehow Ribbentrop and Molotov managed to convince each other that the Anti-Comintern Pact (Germany had signed with Italy and Japan in 1937) was not aimed at the Soviet Union but at “British and French financiers”. Although it was denied by the USSR right up until 1989 (when Gorbachev ordered an enquiry) the “non-aggression treaty” between Stalin and Hitler did have secret “protocols”. These divided not only Poland but also Finland and Rumania plus the Baltic States (Estonia, Latvia and Lithuania) into spheres of influence. These would be subject, in Orwellian-speak, to "territorial and political rearrangements" or invasion. The British suddenly realised the seriousness of the situation and now offered real negotiations but were dismissed by military spokesman Voroshilov and so, 2 days after the signing of the Nazi-Soviet Pact, they signed a defence agreement with Poland. The only achievement here was to cause Hitler to delay invasion for a week (until September 1). Stalin followed on September 17 announcing to the world (with the support of Churchill) that he was only doing it to defend ethnic Belorussians and Ukrainians in Poland. A lie but a justification not lost on today’s man in the Kremlin. The obvious first consequence of the invasion of Poland by the two signatories to the Pact was the wholesale massacre of Poles, both Jew and gentile. Under Nazi racial theory both Jews and Slavs were untermenschen and thus did not count. The Generalplan Ost (Masterplan for the East) essentially called for the extermination, expulsion, Germanisation or enslavement of most or all Slavs living behind the front lines in Europe. As a result somewhere between 50,000–200,000 Polish children were kidnapped to be Germanised. Poland's 'leadership class', the intelligentsia of about 60,000 Polish nobles, teachers, social workers, priests, judges and political activists were killed by Spring 1940. A further 16,000 were killed in May of that year under what was called Operation Tannenberg. All Polish land roughly West of the River Bug was incorporated into the Third Reich. This included Pomerelia (or Gdańsk Pomerania), Kujawy, Greater Poland, Suwałki Region and Eastern Upper Silesia. The rest was put under the General Government, a kind of colonial administration which oversaw, amongst other things, the camp system established there. This effort resulted in the forced resettlement of 2 million Poles. Families were forced to travel in the severe winter of 1939–40, leaving behind almost all of their possessions without recompense. As part of Operation Tannenberg alone, 750,000 Polish peasants were forced to leave and their property was given to Germans. A further 330,000 were murdered. Germany eventually planned to move ethnic Poles to Siberia. And by the end of 1940 Poland had already become the killing ground for Jews, Gypsies, Slavs and other “undesirables” such as political opponents. In the camp system which sprang up all over the General Government genocide was prepared on an industrial scale. Jews were at first forced into cramped ghettoes. 430,000 were in the Warsaw Ghetto where 10% died within a year. In 1941 not only did the Nazis decide on the “Final Solution” of “the Jewish Question” but it was also decided to wipe out all ethnic Poles. But not all the killing was confined to the Nazi side of the Pact. In February 1940 Beria, head of the NKVD had 1 million Polish refugees who had fled the Nazis arrested (half of them Jewish), and sent to Siberia. Many died on the journey. In May 1940, after a joint NKVD-Gestapo selection process, some 25,700 Polish “nationalists and counter-revolutionaries” were massacred at Katyn on Stalin’s orders. And then the purges came to the Baltic states where 34,250 Latvians, 75,000 Lithuanians and almost 60,000 Estonians were deported or killed. The Winter War of 1939-40 against Finland did not go quite as smoothly as Stalin expected. However, after massive Soviet losses (Khruschev later said they may have been I million), the Finns were eventually forced to cede part of Karelia so that about one eighth of their citizens lost their homes. And finally the USSR compelled Rumania to give up parts of Bessarabia so that a new republic could be founded in Moldova. The Pact in fact allowed Stalin to recover much of the territory of the old Russian Empire lost at the end of the First World War. What impact did this piece of imperialist cynicism have on the international working class? Perhaps not so much. This was after all “midnight in the century”. After the double betrayals of Social Democracy’s support for imperialist war in 1914 and the hopes engendered by the October Revolution this was the low point in class consciousness. Those revolutionary workers who had not been killed (by Social Democrats and reactionaries) in the revolutionary wave between 1917 and 1921 were either murdered by fascism and Stalinism or languishing in their concentration camps. And on top of this, the ideological defeat of the Russian Revolution had further decimated the ranks of those who stood for independent working class revolution. The survivors in the descendants of the German and Italian lefts groped around for explanations. Some found solace in the comforting ideas of council communism whilst others tried to come to terms with a failed revolution. And despite Stalinism’s grip, despite the Purges and Show trials, millions still looked to the Soviet Union as “a workers’ state”. For those still following the contortions of the Comintern there was at first a stunned silence. After all the likes of Earl Browder, head of the US Communist Party had said there was as much chance of an agreement between fascism and Stalinism as he had of “becoming head of the US Chamber of Commerce”. There was consternation everywhere. Nowhere more so than in Germany where Stalin callously handed over Communist Party members who had fled the USSR to the Gestapo. 600 German CP members were handed over to the Nazis by Beria at Brest-Litovsk and many more were arrested to be sent to the camps. However double-speak was once again quickly to the fore. It was Molotov who articulated the new line in his report entitled “On the Foreign Policy of the Soviet Union” (31 October 1939). After the German and Russian invasions of Poland the two belligerent powers had made a hypocritical peace offer to the British and French towards the end of September. This was refused. Appeasement was totally discredited. Apart from the lie that the British and French ruling class had always wanted to destroy Hitlerism the hypocrisy of the deal with Hitler was breathtaking. The new line was that “antifascism” no longer mattered. The USSR stood for “peace” against the warlike Western democracies. It had some further farcical consequences. Beria was even told to instruct prison guards in the Gulag system not to refer to prisoners as “fascists”! The French CP had already voted war credits for the fight against fascism and many of its members including its leader, Maurice Thorez had joined the French Army. He, and many of his comrades, now deserted and fled to Russia! Confused communists were now rounded up in France. In Britain the General Secretary of the CP (Harry Pollitt) and the editor of the Daily Worker (J.R. Campbell were both sacked for opposing this extraordinary volte face). The Comintern too rallied to the new line of “peace” and argued that the Pact was simply to maintain it. Walter Ulbricht, later to become Party boss in the DDR (East Germany) led the ideological charge for peace with an article in Die Welt, the Comintern’s German language paper published in Sweden. All Communist Parties were therefore told to suspend anti-fascist propaganda and oppose the war against Hitler, which they did until June 1941. … the treaty with Hitler only supplies an extra gauge with which to measure the degree of degeneration of the Soviet bureaucracy … but it does not provide any basis whatsoever for a re-evaluation of the sociological appraisal of the USSR. “the question of preserving state property in the means of production in the USSR is subordinate for us to the question of world proletarian revolution”. There is no doubt that the Nazi-Soviet pact took place at a nadir in the fortunes of the revolutionary working class. The Italian fraction of the international communist left had dissolved with their final publication Octobre appearing just as the pact was signed. This even denied that World War Two would break out in 1939. It would not be until 1942 that opposition to both imperialist camps in the shape of a tiny French fraction of the communist left would emerge at around the same time as the Internationalist Communist Party was struggling into clandestine existence but that is another story. Meanwhile the Nazi-Soviet Pact was to remain in force for almost two years with further deals which allowed the USSR to take Rumanian territory whilst the Germans were fighting in the West. Stalin always knew (it is all over Mein Kampf) that ultimately Hitler’s aim was to attack the USSR. After the signing of the Pact though he was confident that the war in the West would delay any plans Hitler might have. The rapid fall of France caused him a moment of panic but Hitler’s failure in the Battle of Britain made him believe that no attack would come soon. What he did not reckon on was that Hitler was not only ideologically committed to eliminating “the Jewish-Bolshevik intelligentsia” but now saw defeating Russia as a way to provoke the surrender of “England” rather than defeating Britain first. As early as the summer of 1940 Hitler had the Wehrmacht preparing a strike against the USSR. Stalin was warned several times by his own intelligence service as well as by the German Ambassador to Moscow and Winston Churchill that an invasion was imminent. Stalin dismissed it all as part of a “campaign of disinformation”. Even after Hitler broke the Pact on June 22 1941 by invading the USSR he still did not believe it. Indeed he retired incommunicado to his dacha expecting the Politburo to sack him. Instead they waited for orders which did not come for hours and in that time hundreds of thousands more Soviet citizens died. Now for the third time in 2 years members of Communist parties throughout the world had to change tack and the “anti-fascist war” was on again. In Russia though it was another nationalist “great patriotic war” to defend the “Motherland” against the enemy. The first step in the wartime alliance with Western democracy was now taken. An article on the Ukraine situation itself is in preparation where the international background will be gone into in more depth. For the moment we should note that these 'ceasefire' manoeuvres are not just in response to the Russian military intervention, but to Russia's tightening of gas supplies, and the crippling effect of the war on an already drained Kiev economy. For a more detailed analysis of the Spanish tragedy see our pamphlet “Spain: From Working Class Struggle to Imperialist War” (£3 from the group address) or type “Spanish Civil War” into the search function on www.leftcom.org to find some of the main articles. Both Prime Ministers Daladier and Chamberlain headed Conservative administrations. The majority of British Conservative MPs were pro-Nazi (after all Hitler had tamed his working class) and they were the backbone of “appeasement”. Among them only Churchill and his allies saw this as an abandonment of 200 years of British imperialist policy which was always to oppose the leading power on the continent of Europe. As we are on the subject of secret wars it should be noted that, after taking Manchuria in 1931, Japan had been waging an undeclared war in the Far East of Russia. One consequence of the Nazi-Soviet Pact was that Stalin, after winning the battles of Khalkhin Gol, was able to sign a peace, which later became a neutrality agreement, with Japan on September 15 which held until August 8 1945. Signing this pact allowed Stalin to invade Poland 2 days later without fear of a threat from the East. Hermann Weber: „Weiße Flecken“ – in der Geschichte. Die KPD-Opfer der Stalinschen Säuberungen und Rehabilitierungen, Frankfurt am Main 1990. And of course the most prominent source: Magarete Buber-Neumann (she was the wife of Heinz Neumann): Gefangene bei Hitler und Stalin. Eine Welt im Dunkel. München 2002. See Fabio Damen Il _ruolo di Russia nella Seconda Guerra Mondiale_ in Prometeo 3 IV Series (December 1979). In terms of psychology, people tend to behave in ways which they find rewarding, and avoid behaving in ways which they find to be adverse to whatever their situations seem to be. A major motive in modern wars is for manufacturers and distributors of weaponry and of military vehicles and aircraft to make as much profit as they can. Propaganda of all sorts either aids or hinders that process. Overproduction of those products sooner or later almost certainly forces the owners of such industries to favour and/or promote new wars, or go bust. If these points reflect reality, then they might provide criteria for helping to analyse the history of what as been and still is going on.